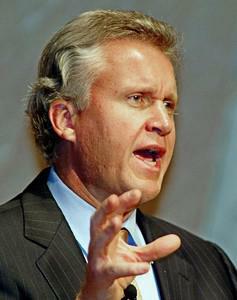 The Leader's Guide to Radical Management: Wakeup Call For GE: Mr. Immelt, Pull That Ad! I watched as workers in contamination suits struggled to deal with the multiple failures of the backup cooling systems and prevent the disaster from getting any worse. A commentator noted that GE was affected because it has a nuclear energy joint venture with Japan’s Hitachi and it supplied three out of six reactors at Fukushima No. 1 plant. All six reactors have experienced differing degrees of problems since the quake and the ensuing tsunami. GE is in talks to sell nuclear reactors to India. GE’s share price has fallen 6% in pre-market New York trading this morning. Immediately after that, an ad from GE came on on CNBC, showing among other things workers in contamination suits happily dancing to the beat of GE’s “Ecomagination”. Was I watching the news or Saturday Night Live? Even if GE had had nothing to do with the unfolding nuclear calamity in Japan, the ad is in the worst possible taste. But GE is not just an innocent bystander. GE designed and built the plant which has caused the accident. Even if nothing worse happens than has already happened, the incident has already been responsible for loss of life, injury and contamination of an unknown number of people. The risk that the incident could verge towards a massive catastrophe is still there. What is GE saying and doing? Mr Tetuan’s statement may be factually accurate as far as it goes, in the same sense that it is factually accurate to say that 1500 happy passengers reached New York after the Titanic’s maiden voyage. The statement misses the whole point of what is going on. Four days after the calamity began unfolding, GE is denying there is a problem and playing ads with dancing workers in contamination suits. Is no one at GE watching the news or thinking about the messages it spending large sums of money to disseminate? Two weeks ago, I wrote that GE has a problem: its share value is now roughly 50% of what it was ten years ago. This stems from a way of a managing that pushes products and services at customers, of tweaking the supply chain, of parsing and manufacturing demand, with the goal of making money of shareholders. Continuing to play the ad with the dancing workers in contamination suits tends to show that “ecomagination” is just another product that GE is pushing at its customers irrespective of its relevance. If GE is to become a company that that is truly concerned about the welfare of its customers, a first step would be for GE’s CEO to pull that ad with the dancing workers in contamination suits . Interesting post. I believe these problems should be resolved by the GE management. This is a very important factor for good employees to stay with them. Will the company have to disclose that an employee has a criminal conviction.